This year’s CES boasts a wide array of breakthroughs in consumer and business technology, but no market is capturing attention on the show floor quite like the Smart Home innovations on display. From smart locks and surveillance cameras that keep your home safe to bathroom breakthroughs there’s a new piece of must-have home tech popping up every week. What was once a niche innovation grows more and more mainstream with every CES, as Smart Home technology has seen massive growth over the past year. And it’s even making its way into the bathroom with products like the Kohler Verdera Voice Lighted Mirror with built-in Amazon Alexa. 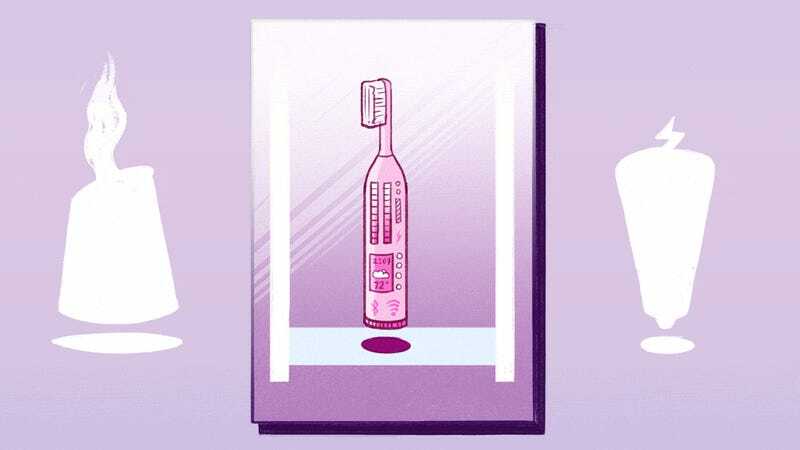 Featuring high quality speakers and voice command, the Verdera Voice Lighted Mirror keeps you connected while you go through your morning routine, allowing you to check the weather or traffic while you put on your makeup and add shaving cream to your shopping list without missing a beat! And while it’s true each year we get closer to that dream of a Jetsons-style, super-connected home, we started thinking about some of the future tech that we most want to see that doesn’t yet exist. Let’s start in the bedroom. Whether the winter winds are blowing or the heat of summer shines down, we can never seem to get the temperature in our bedroom just right. A lot of that problem stems from our blankets—are we using too thin a blanket, too thick? How amazing would it be to have wifi-connected smart sheets? Like a heated blanket without the tangle of wires, we’re dreaming of a set of smart sheets that could respond and react to our body temperature, heating up or cooling down until we reach a predetermined ideal temp. In the kitchen, we’d love to see smart refrigerators develop ways to tell us when our food is about to expire. From monitoring freshness and chemical output to adjusting temperatures, we imagine a future where our refrigerators warn us that we’ve only got two days left to finish those leftovers before they’re better off tossed. And how nice would it be to have a temperature controlled oven that could keep food as cold as a freezer until it was time to cook? By synching with an app, our cool-oven (yes, you read that right, a cool-oven) would know when we were on our way home from work, and would switch from refrigerator mode to oven mode just in time to cook up that roast we’d left chilled under the broiler. We could happily spend all day dreaming up other amazing Smart Home technologies—from mood-sensing, app-based aromatherapy diffusers that could adjust the smell of your home to suit your mood, to personal car wash garages that could suds up your hybrid with the swipe of a finger—but we really want to hear from you. So, readers, what smart home technology do you wish existed? Tell us in the comments. And for more stunning visions of the future, check out all of the new smart home products Kohler’s developed and premiering at this year’s CES.